MeowBit, or why Pierce Brosnan thought Michael Dean was Drunk. 60-minutes. Bad Quaker show. 2/7/14. MP3 is HERE. Davi Barker talks about MeowBit with Ernie Hancock at Texas Bitcoin Conference on DECLARE YOUR INDEPENDENCE radio show. 40-minute file, first few minutes is about MeowBit. 2/6/14. MP3 is HERE. Neema Vedadi from the Freedom Feens on Free Talk Live radio show taking about MeowBit, Dot-Bit and Namecoin. 16 minutes. 2/5/14. MP3 here. Michael Dean on Peace News Now radio show taking about MeowBit, Dot-Bit and Namecoin. 41 minutes. 2/4/14. MP3 here. Discussion about MeowBit on radio show Free Talk Live. 10 minutes. 2/4/14. MP3 here. Michael W. Dean is interviewed for an hour by Derrick J. Freeman on the Angel Clark show on LRN.fm. 39 Minutes. 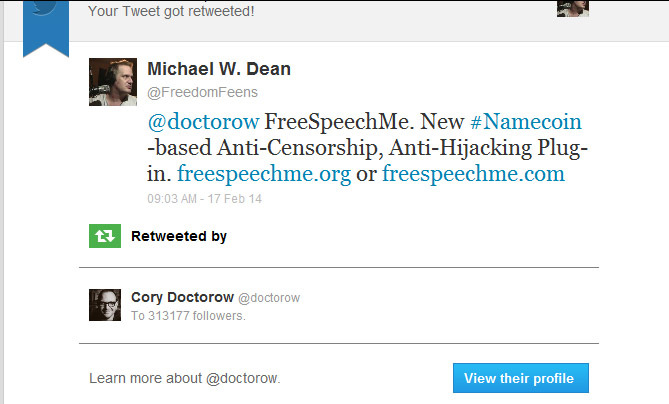 “The Inside Scoop on How MWD Went from FreeSpeechMe to MeowBit in One Week.” 2/4/14. MP3 here. Jeremy Rand and MWD discuss FreeSpeechMe, Namecoin and Dot-Bit on Let’s Talk Bitcoin podcast. Recorded 2/11/14, released 3/9/14. The Ed and Ethan Show. 2/16/14. Michael Dean Talks FreeSpeechMe Plug-in, Dot-Bit and Namecoin. 32 Minutes. MP3 here. The Allison Bricker Show, on Daily Paul Radio Network. Michael Dean Talks FreeSpeechMe Plug-in, Dot-Bit and Namecoin. 39 Minutes. MP3 here. Sovryn Tech Podcast, episode 60. FreeSpeechMe is “Pick of the Week.” Get the MP3 of the 13 min. segment. Michael Dean talks FreeSpeechMe Plug-in, Dot-Bit and Namecoin on the radio show Declare Your Independence With Ernest Hancock, Friday, Feb 7, 2014. Interview is 37 minutes long. Direct MP3 link of interview only is HERE. Michael Dean talks FreeSpeechMe Plug-in, Dot-Bit and Namecoin on The Angel Clark Show. Thursday, Feb 2, 2014. Interview is 18 minutes long. Direct MP3 link of interview only is HERE.